With three defensive starters out with international duty, the worry was that the backups might not be able to keep up the high standard. The worry should have been on the other end, as Metro's offense pulled up flat and failed to create many significant chances in a 1:0 loss to a bad Orlando team. Old friend Sacha Kljestan had the lone goal of the match. The makeshift backline saw Tim Parker joined by Connor Lade, Amro Tarek, and Kyle Duncan. It had to be shaken up even more, when Lade pulled up with an injury midway through the first half. Alex Muyl shifted to emergency left back. Orlando was content to pack the center of the field and hack away at every opportunity. It worked; other than for brief moments, the Metro attack just could not get into gear. Their best chances came off set pieces. In the first half, a Muyl shot off a corner forced a good save by the keeper. In the second, a scramble off a free kick saw the ball saved off the line by an Orlando defender. All the visitors needed was one Metro mistake, and they got one in the 73rd. 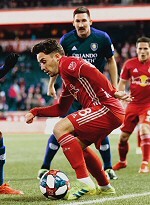 With the defenders out of position, a ball was crossed into the box, where Kljestan slotted it home. Orlando got what they needed, and were content to hack away for the rest of the match, holding on to the victory. Lineup: Robles, Lade, Tarek, Parker, Duncan, Davis, Rzatkowski, Bezecourt, Muyl, Royer, Wright-Phillips. Subs: Fernandez, Jorgensen, Ivan.